A host of powerful technologies, including a Full HD CMOS sensor and DIGIC DV 4, effortlessly capture stunning quality movies – even in tricky low light. Plus you can easily make your movies sound as good as they look with Audio Scene Select, which automatically optimises audio settings to match the scene you’re shooting. Shoot exciting movies by flexibly switching between slow and fast motion while recording; then add fun effects with Touch Decoration, or create atmosphere with Cinema-Look Filters. Create fun albums for up to three children and automatically save key childhood moments to a selected album with advanced Baby Mode. Enjoy comfortable shooting for longer thanks to a light, compact ergonomic design and simple, intuitive fingertip control with a large, articulating touchscreen. Simply point and shoot for great looking movies with automatic scene selection, then share with ease via your smart device thanks to Wi-Fi with NFC. Easily capture all the detail in distant objects with the huge 57x Advanced Zoom lensZOOM LENSAllows a camera to, unlike a fixed-focal length or prime lens, change smoothly from a long shot to a close-up or vice versa by varying the focal length. A true zoom lens, also called a parfocal lens, is one that maintains focus when its focal length changes. Due to more moving parts, zoom lenses often produce images of slightly lesser quality than their prime lens counterparts. However due to the inherent flexibility of being able to vary the focal length, they are extremely popular for photography where composition needs to be adapted quickly - such as at weddings, for example. and automatically keep your subject in the frame with Zoom Framing Assist. Intelligent optical image stabilisation keeps your footage steady even when walking or zooming in. Record for longer on a single charge – and always be ready to capture the moment - thanks to a high-capacity, long-life battery. Simultaneously record movies in maximum quality to the 16GB built in storage, to showcase and keep, and in small easy-share files to an SD card. A Full HD CMOS sensor and powerful DIGIC DV4 imaging processor ensure superb image quality and excellent colour reproduction even in low light. Highlight Priority mode creates detailed, natural looking movies that retain the quality of sparkles and reflections in bright sunlight - great for summer sunshine. Backlight correction automatically brings out great detail in all parts of the image – even in tricky backlit scenes. Speed everything up, by a maximum of 1200x with fast motion or cut speed by half when shooting in slow motion. Shoot exciting movies with dramatic effects by flexibly changing the speed between .5x, 1x, and 2x whilst recording. Add original and fun effects to movies using Touch Decoration, which lets you add handwritten message and creative stamps, or create atmosphere with Cinema-Look Filters. Capture the first steps, first words - and a host of other key moments - with advanced Baby Mode. You can create fun albums for up to three children and footage will automatically be saved to your selected album. 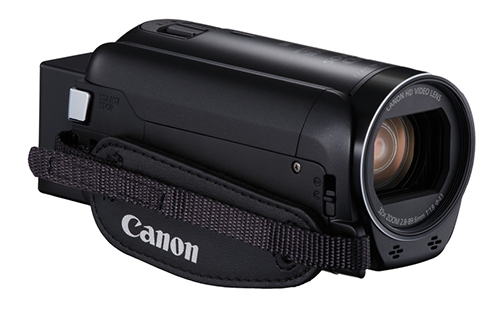 Hold, aim and shoot in comfort for longer thanks to the camcorders light and compact ergonomic design. Enjoy simple, intuitive fingertip control of shooting and playback functions using a high-resolution 7.5cm (3.0”) articulating touchscreen LCD with increased brightness and a wider colour range. 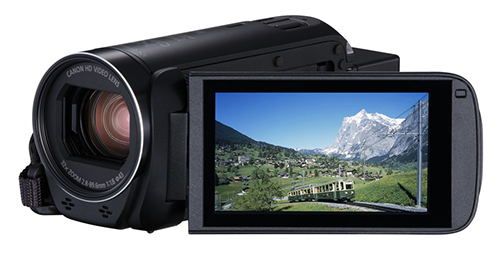 The articulating LCD panel lets you shoot from awkward angles, and opening it quick starts the camcorder, so you’ll always be ready for that crucial shot. Instantly capture great looking movies without having to worry about settings with automatic scene selection and focus. Connect easily to smart devices using Wi-Fi and NFC. 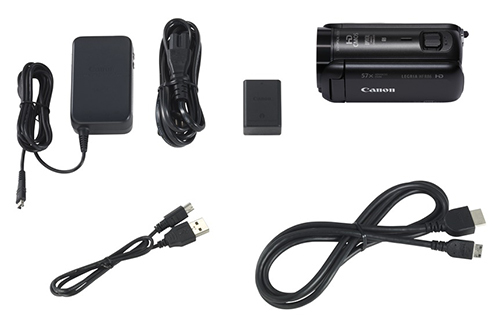 Effortlessly enjoy wireless remote shooting and sharing of MP4 videos to your social networks via Canon apps. Pair with CS100 over Wi-Fi and NFC for an easy way to store, view, and share your movies. Capture easy-to-watch, rock steady movies - even when walking or zooming in - with intelligent optical image stabilisation. It automatically detects the scene and selects exactly the right optical image stabiliser settings from 4 specialised modes to counteract movement along 5 axes and prevent blur. 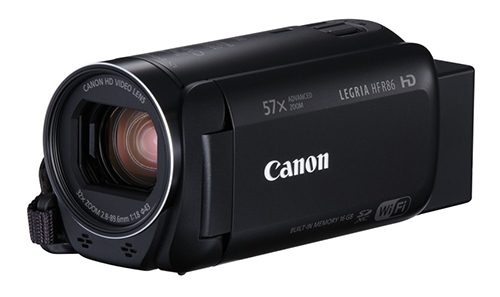 The HD video lens lets you capture all the detail in far away subjects thanks to a huge 32x optical zoom and 57x Advanced Zoom, which extends your telephotoTELEPHOTOA lens with long focal length capable of making distant objects appear nearer thus larger. Essentially, it isolates and magnifies the subject so that it appears as a full image when shooting from a distance. Telephoto lenses are ideal for photographing subjects that are further away, such as wildlife and sports photography. range even further. Respond quickly to the moment and easily keep your subject in the frame with Zoom Framing Assist, which automatically tracks your subject and senses camera movements for you – perfect for spontaneously capturing children at play or distant action. Record for longer on a single charge – and always be ready to capture those precious moments - thanks to the high-capacity, long-life battery. Start filming straight out of the box thanks to 16GB of built-in memory, which you can also use as additional storage when your SD card is full. Simultaneously record movies in maximum quality to the built in storage, for showcasing and keeping, and in small easy-share files to an SD card. Highlight Priority mode uses a setting that allows more detail to be captured in the bright areas of an image, so typically over-blown highlights such as reflections from glass, water and metal can be recorded accurately. Now Backlight Correction can be selected in Highlight Priority mode, to provide a combined setting that reduces blown out highlights in movies with backlit subjects, for even more dynamic and natural looking scenes when viewed on modern HDTVs with their powerful backlight technology. Auto Framing Assist allows users to focus on their framing at high zoom, while the camcorder keeps track of their subject and senses camera movement for them. It automatically zooms out little by little during panning to help you keep the subject in the frame – even as they move – them zooms back in once panning stops. 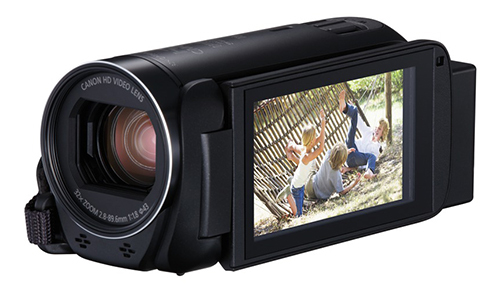 Ideal for shooting great movies of people, especially kids, on the go, or distant wildlife. Users can now change the frame rate of their movies whilst recording via on-screen buttons to create dramatic creative effects. They can speed everything by x2 to capture fast motion or cut speed by x1/2 to shoot in slow motion. Sound is not recorded when shooting in fast or slow motion.